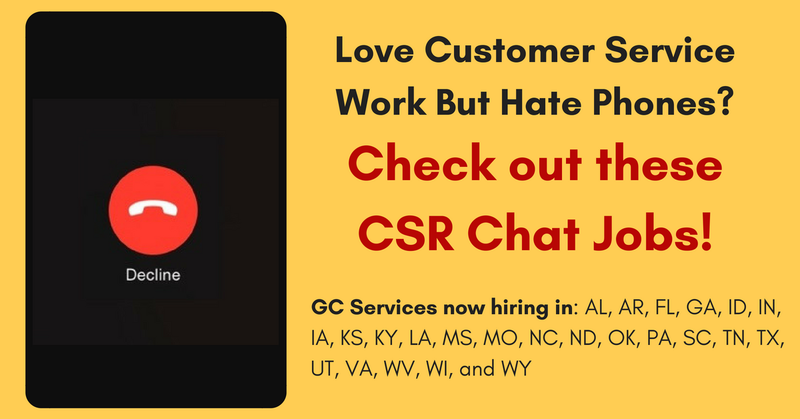 If you are great at providing a stellar customer service experience, but really don’t like talking on the phone, these Chat Customer Service Rep positions with GC Services may be just what you’re looking for! The company is currently hiring in the following US states: AL, AR, FL, GA, ID, IN, IA, KS, KY, LA, MS, MO, NC, ND, OK, PA, SC, TN, TX, UT, VA, WV, WI, and WY. “Provide quality service and information regarding various available products to inbound customers via Chat while working from home. Six months of customer service experience is preferred. Experience with personal computers preferred. MAC use a plus. Must be able to type quickly and accurately, 35 wpm with 95% accuracy, use a mouse effectively, and have a basic understanding of operating systems. 45 wpm is preferred. Must be able to troubleshoot basic computer issues including connectivity with internet service provider. Ability to maintain a well-organized work area. This entry was posted in Chat Jobs, Customer Service Jobs, Hiring Companies, Work at Home Jobs and tagged chat, GC Services. Bookmark the permalink.